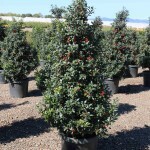 A naturally pyramidal, mite resistant holly with deep green, glossy, foliage. Bears a heavy crop of bright red, long lasting berries, when planted near a male holly. Insignificant white flowers. 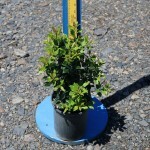 Easily grown in average, well-drained soil in full sun to part shade. Introduced in 1999 by The Conard-Pyle Company. PP 10,750.